It seems that running a concession stand as a fundraiser is almost unavoidable for sports teams and other school clubs these days. It’s a lot of work and organization and requires a deep commitment on the part of the volunteers. 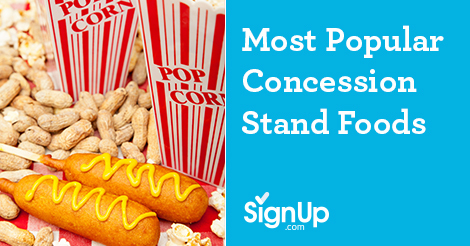 If you are running a concession stand as a fundraiser, it’s important to know which foods sell best. Keep in mind that the event at which you’re selling might determine what you sell to some extent. You might not want to sell messy nachos at a black-tie event! Hot Dogs - Hot dogs seem to sell well no matter whether your venue is a sporting event or an art walk. Be sure to have a variety of toppings in addition to ketchup and mustard. Popcorn - There’s nothing like the smell of those buttery kernels to break down the resistance of even the most dedicated non-snacker. Big Pretzels - Big, chewy pretzels are a wonderful treat, and can be served with a minimum of toppings. Anything Fried - Today, concession stands at county fairs and other events will often have a host of different fried treats. The fried creations are an attraction unto themselves, and they may help draw business to your booth. Some of the popular fried concoctions out there today include fried candy bars, fried pickles, fried ice cream, and even fried butter! Prepackaged Items - Many concession stands also have some prepackaged items for sale, such as chips, candy, crackers, and even gum. Brand names tend to sell better than off brands, and most concession stands need to experiment with how much prepackaged items to buy in order to make money. Seasonal Items - Seasonal items like hot cider or chocolate in the fall and winter and popsicles in the spring and summer can be really profitable. Healthy Choices - Consider testing healthy options like trail mix, muffins, cheese sticks, hummus and crackers, and fruit or veggie cups. Your crowd may surprise you leading to a few higher-dollar, higher profitable items. Local Flavor - Are breakfast tacos, kolaches, edamame, or a local favorite dish a popular addition to any community event? By all means, match with a local vendor to bring in regional favorites to make your fundraiser even more successful. Remember your volunteers are key to your success and the best way to keep your volunteers happy and showing up is to make the job as easy as possible for them. Use free SignUps at SignUp.com to schedule shifts. With 24/7 access from any smart phone and computer with no password required, scheduling takes place in real time. SignUp.com sends out automatic reminders and provide eCalendar syncing. In addition to scheduling shifts, SignUp.com allows you to open up other jobs for volunteers who want to be involved but can’t make the concession stand times. Create a SignUp for someone to order supplies from the local big box store. This can often be done online, and then another volunteer can be scheduled to pick the order up and deliver it to the booth. Don’t forget to give your volunteers breaks and a snack on break. And let SignUp.com send out thank you notes after their shifts! Looking for more great fundraising ideas, check out our Fundraising Ideas Center.